Next up in our series about Christmas in London, the markets and fairs!!! Now, there's hundreds of them and to be honest, they're all pretty good so we're not going to tell you about them all. However, if you want to know about them all, check out Time Out London. The Barbican Christmas market has over 35 independent designers, brands and artisans showcasing their goods and crafts for you. Choose from vintage clothes and designer clothes, arts and crafts, jewellery, books and toys. Of course, no Christmas market is complete without plenty of mince pies and mulled wine. Thankfully they won't be in short supply at the Barbican market. This is huge and everyone probably knows all about it! One of the biggest Christmas fairs in the country, the huge Christmas market is accompanied by a fun fair and, of course, Santa lurks in a grotto! Don't come here if you're on the fence about Christmas though, the constant Christmas music (you know the ones) and plethora of Christmas is great for kids and big kids. A personal favourite area of London so a personal favourite Christmas market. Probably better know as More London Market, the London Bridge do has over 100 independent traders selling homemade gifts and food from German style chalets. Yet again, alcohol is the order of the day with Christmas cocktails, mulled wine, hot cider and craft beers in abundance. Be quick, this one is only around for the weekend and ticks the boxes where fairytale Christmas is concerned. I'm not sure why, but we Brits have a very Bavarian style view of the perfect Christmas. There is, of course, an indoor market to be enjoyed by all and chalets that serve - you guessed it - Bavarian food (sausage) and drink (beer and wine). Then, the family friendly stand up from the Comedy Club should hit the spot. 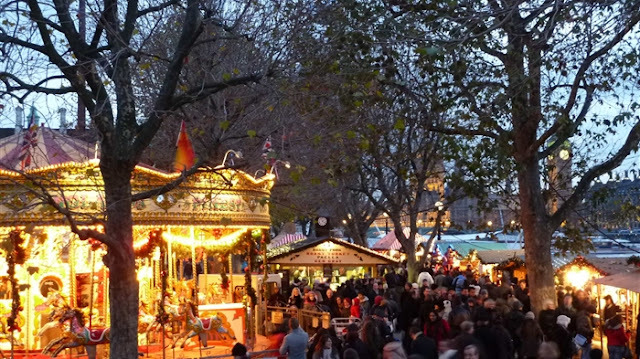 So there you have it, our favourite Christmas markets and fairs in London. As mentioned, there's hundreds more where that came from so don't feel limited to this list! Next up in our Christmas series is favourite ice skating venues so look out for that this week!